SB 2301 Heavy-Duty Rust Stain Remover is a more aggressive version of our SB 2300 Rust/Manganese Stain Remover. It is used to remove heavy rust stains that have accumulated over long periods of time. In many cases, these stains have become or are approaching the point of being a scale more so than a stain. 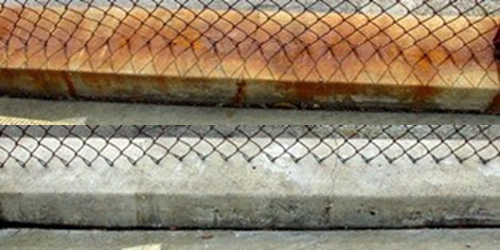 The extensive corrosion of chain link fencing or the rusting of iron attachments to masonry structures can create heavy staining that only a product like SB 2301 can remove. This carefully selected blend of acids and surfactants has solved a long-standing problem in the restoration industry that, in the past, had been delegated to abrasive cleaning and the probability of unwanted changes in the appearance of the masonry. Note that SB 2301 may etch certain acid-sensitive masonry surfaces. Provide protection for foliage, pedestrian and vehicle traffic. Test all surfaces, which may be exposed to the product for possible adverse reactions. Protect all surfaces and surrounding areas from possible damage which might occur from spillage or spray during usage. All projects should start with a test application to determine the suitability of the cleaner, acceptable application method and possible dilution and dwell time. Always soak the surface to be cleaned with water prior to the application of the stain remover. The test area should involve the most severely affected area. Before starting the project, allow the test area to dry in order to check for possible adverse reactions. Soaking the surface prior to application of the product is designed to reduce the penetration of the cleaner where it is not wanted and to keep it on the surface where it is needed. Dilution: 0 to 3 parts water to 1 part product — test application recommended. In most cases, SB 2301 is used undiluted. Dilution with 1 to 3 parts water may be necessary for some applications. Soak the surface to be cleaned with water and apply SB 2301 with acid brushes, chemical resistant rollers or low pressure spray. Brush agitation with either stiff masonry brushes or brass brushes may be beneficial when removing heavy deposits. After the predetermined dwell time has passed, rinse the surface with a quick low pressure rinse. This is necessary to remove excess cleaner and stop the reaction. Follow with a thorough high pressure rinse as appropriate. In most cases, dwell time should not exceed 15 minutes. Care should be exercised in the selection of tips and pressures to avoid doing damage to the surface. In most cases, SB 2301 is used undiluted. Dilution with 1 to 3 parts water may be necessary for some applications. SB 2301 Heavy-Duty Rust Stain Remover is for use by profes- sional contractors only. Do not use SB 2301 for the removal of manganese stains from brick masonry. SB 2301 may remove color from colored mortar, some sandstones, colored cast stone, colored concrete and concrete block or any material. Causes severe skin burns and eye damage. Causes serious eye damage. Toxic if inhaled.Refer to product SDS or product label for hazard statements, precautionary statements and safety information.